So you ask… What the heck is a Nacktspektakel? Well, it’s a night of spectacular fun is my explanation. 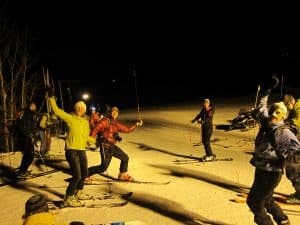 A Nachtspektakel (pronounced knocked-shpeck-tockle) is a traditional European-style ski event that bonds people through the sport of ski touring. 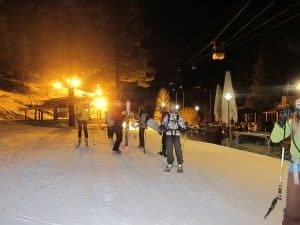 A cultural norm in Europe, night spectaculars are new ways to combine skiing, beer and food that are sure to catch on in the States, and in my opinion, they are here to stay! There is no better way to spend a Saturday night than skinning, drinking and meeting like-minded new friends. 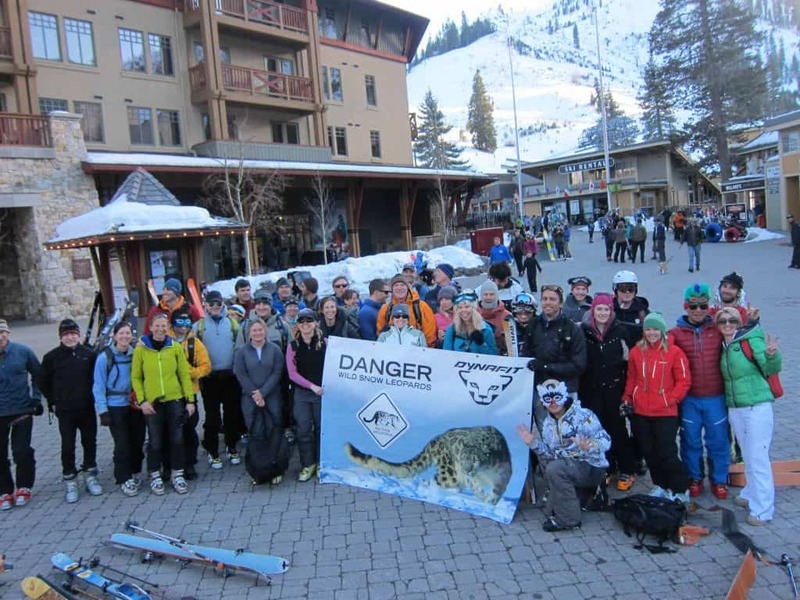 A group of 50 gathered at the Village at Squaw Valley to meet up and embark on this unique event. We headed up the summer trail with the goal of High Camp on our minds and cold beer and hot food as our rewards. 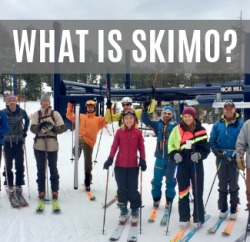 This was not your ordinary group of 50 seasoned backcountry skiers because there were people of all ability levels and with all types of gear. 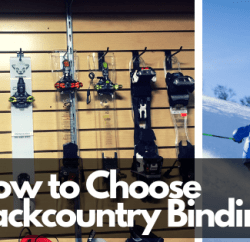 Abilities ranged from folks who had never donned skins before to the most seasoned of backcountry skiing vets along with splitboarders, Dynafit enthusiasts, telemarkers and the sidecountry-specific Marker Duke users of the world. 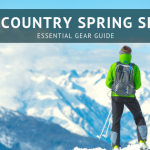 Once we arrived at High Camp at Squaw Valley USA, we were greeted by friendly staff ready to help us to our beverages of choice and serve us up a 3 course meal with salads, soups, burgers, pork shoulders and a wonderful berry cobbler dessert. Quite the meal for such high altitude dining. There was much revelry and many smiling faces throughout the event, but the dinner and camaraderie while at High Camp was at an all-time high. Everybody was truly stoked to be part of such a unique and fun event. 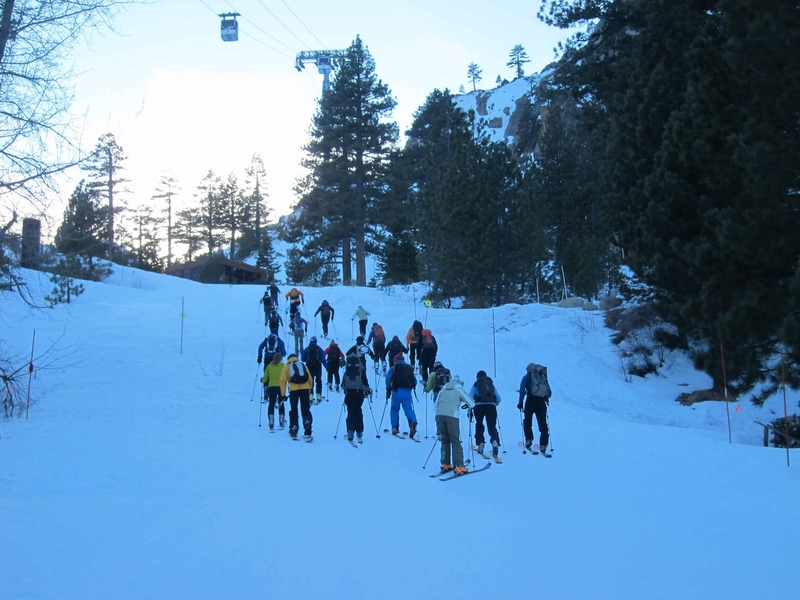 As the evening wore on, Squaw ski patrol was looking out for our safety and making sure we didn’t drink too much, so they started to shepherd us out of there and got us skiing on down the hill. As everybody geared up, the excitement for the ski down started to increase and more smiles came out because after all, at heart, we all love the downhill and that’s why we do the uphill to begin with! Skiing down in and out of the Squaw Valley lights was a great experience, and there was a lot of woot-wooting and hollering all the way down. Benefiting from the night was the Snow Leopard, an endangered species currently living in the high Himalaya of Tibet and China. 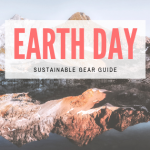 A portion of everybody’s registration fee is being donated to the Snow Leopard Trust, which is working to conserve these mysterious animal’s habitat and existence and is a truly worthy recipient of our donated dollars. Thanks to them for all the work that they do. 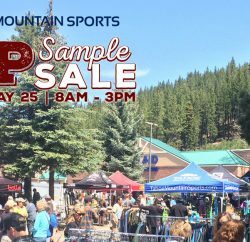 Lastly, thanks to the sponsors of this great event, Dynafit, Squaw Valley USA, Alpenglow Sports in Tahoe City and of course, ourselves, Tahoe Mountain Sports. We look forward to putting on more great events like this and hope you will join us! For more photos of the Tahoe Dynafit Nachtspektakel event visit our Facebook page or Kenny Blum Photography. 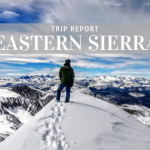 Previous PostYosemite Ice Climbing: Clouds Rest Next PostTahoe Cross-Country Skiing... well it's about time!